Growth form: Annual grass. Flowering. Apr. Status: Native. Local. Also recorded: E Saudi Arabia, UAE. Habitat & distribution: Occasional in Doha gardens and lawns, and in cultivated fields. May be native in some areas, but widely naturalised. Uses: Used for fodder (El Amin). 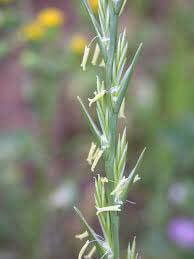 Toxicity to sheep and cattle has been reported; ingestion of seed- heads can cause neurological disorders and especially affects the bovine liver (Rizk & El-Ghazaly).